This side dish is sure to brighten up your table. Sweet potatoes are high in the Vitamin A, which gives them their vibrant orange color. This recipe uses yogurt to make it creamy and fresh oranges instead of orange juice for some additional fiber and less sugar. Prick potato skins with a fork. Microwave on high for 6 to 8 minutes until soft and easily pierced with a knife. Scoop out the potato pulp into a medium bowl. 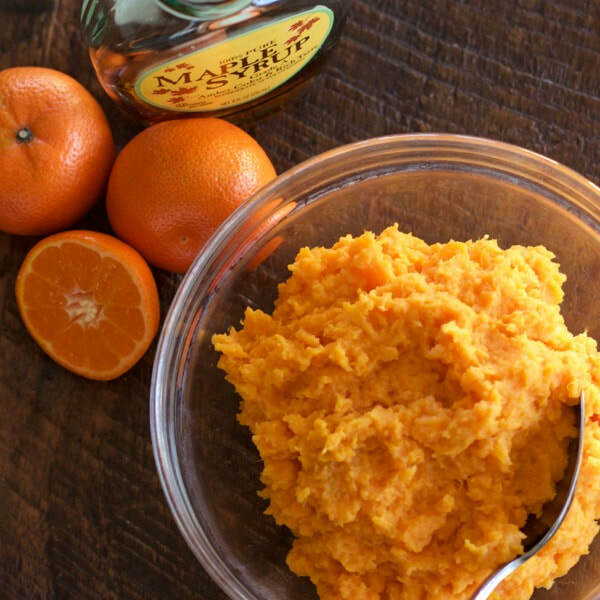 Mash the pulp and stir in the yogurt, maple syrup, and orange juice. Transfer to a microwave safe serving bowl and microwave for 1 to 2 minutes to heat through.